Add a link to your bird-related website. 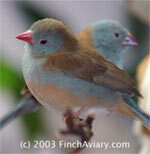 Take our Finch Owner's Survey and tell us about your bird keeping practices. We welcome your comments and questions. Feel free to contact me via e-mail. Please try to remember to include a subject line that refers to this site or to something bird-related, so that I do not accidentally delete your comments with the spam. Your feedback is important.